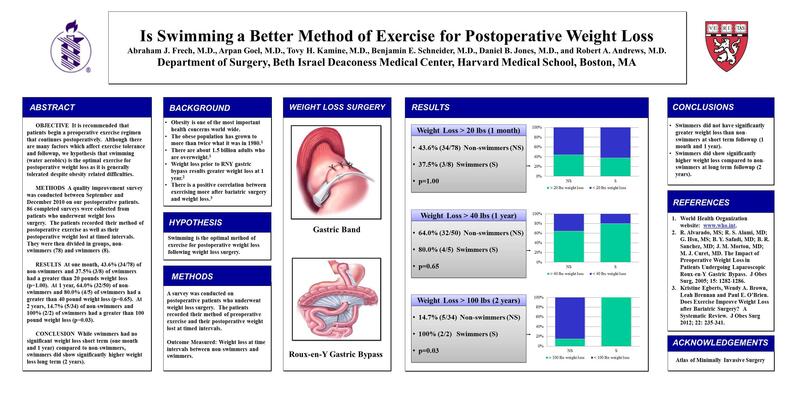 Is Swimming a Better Preoperative Method of Exercise for Post Operative Weight Loss? Much emphasis has been given to the importance of exercise prior to weight loss surgery. Swimming in particular has been suggested as a superior form of exercise given the prevalence of musculoskeletal disability in the morbidly obese population. The aim of our study was to determine if swimming more positively affected post operative outcomes than other forms of exercise. Between September and December 2010, 108 surveys were collected from postoperative weight loss surgery patients at an academic medical center. Patients included in the survey underwent either Roux-en-Y gastric bypass or adjustable gastric band. Of the 108 collected surveys, 22 were excluded as incomplete. The 86 included surveys of patient who underwent either gastric banding or gastric RNY bypass. The patients recorded their type of preoperative exercise and their postoperative weight lost. We divided patients into two groups based on their method of exercise in the preoperative period, non-swimmers (78) and swimmers (8). Table: Percentage (number) of non-swimmers and swimmers reaching weight loss cut offs at various post-operative time points and p values from fisher exact test. At one month, 43.6% (34/78) of non-swimmers and 37.5% (3/8) of swimmers had a greater than 20 pounds weight loss (p=1.00). At 1 year, 64.0% (32/50) of non-swimmers and 80.0% (4/5) of swimmers had a greater than 40 pound weight loss (p=0.65). At 2 years, 14.7% (5/34) of non-swimmers and 100% (2/2) of swimmers had a greater than 100 pound weight loss (p=0.03). While swimmers had no significant differences in short term weight loss (one month and 1 year) compared to non-swimmers, swimmers did show significantly higher weight loss at a longer term time point (2 years). Swimming may be an excellent method of exercise for the morbidly obese post surgical population in that it is low impact, and may be correlated with better surgical outcomes; however, further studies and longer term followup may be necessary.